» Cure homelessness, but how? Abandoned in the Waverly Memorial Park cemetery, here was a reminder that the situation of the homeless and unsheltered has not been solved. Numbers are hard to come by, and the ones collected by public agencies are not reliable. Still, they give you an idea. Counts done each January over the last three years put the number of homeless persons at between 100 and 300 in Benton County and around 200 in Linn County. In the three West Coast states, the Associated Press reported this month, the number of homeless was about 168,000, up about 19,000 over the last two years. That may not be the main cause in the mid-valley. But clearly, people would not willingly subject themselves to suffering outdoors through a cold Oregon winter if they could afford to be inside under their own roof. So more housing — housing cheap enough for people with a subsistence-level income to afford — would be one answer. How to encourage cheap housing? How about allowing it to be built so it really is cheap. Or less expensive. Allow smaller lot sizes and tiny houses everywhere. Reduce or eliminate whatever regulations or permit requirements stand in the way. But no matter how cheap housing can be made, it’s always going to cost something. So for people with no ability to keep a job and earn money, we’ll always need shelters like Helping Hands and the Signs of Victory Mission in Albany. There were no homeless people in the 1960s and in the several decades after that, no beggars on street corners, none that I remember seeing anyway, and certainly none in the numbers seen in recent years. Now we have many things to blame for the status quo: The conversion to a knowledge economy, life getting more complex than some people can handle, the disappearance of jobs that anybody could do, drug abuse, untreated mental illness, the closing of state institutions, and yes, rising rents. The solution? Reverse the policies that can be reversed. Otherwise, I have no idea. But if you want to do something, go to the Albany Homeless Persons’ Memorial Day Observance at 5:30 p.m. Dec. 21 in the City Hall Plaza. It’s sponsored by HEART, the local group that deals with this issue as best it can. And take along a donation of things like blankets, rain gear, socks, underwear or coats. The owner of this cart found a place to sit in City Hall one sunny day last January. How is life more complex than it was 20 years ago, 30 years ago, 40 years ago? There are plenty of job that anybody can do, the problem is that no one wants to do them. While SOME homelessness can be blamed on alcohol and drug abuse, untreated mental illness and often outrageous housing costs…what about the folks who choose homelessness? No responsibility, no accountability…hell of a good deal. Sadly this problem will only get worse as affordable housing options shrink and options to access mental health care / drug addiction treatment disappear. I would love to build affordable housing on my property. I proposed a duplex and went through the city review process. By the time we got ready to start the project the city DOUBLED the assessments to $40,000 and that is before even breaking ground. They need to let property owners build for a reasonable amount on what are called “in fill” small properties within the the city limits. The low income project on Old Salem is a great example of town homes that we need more of. Are there any proposed in the near future? There is value in pondering the problem of homelessness. The scale of the situation has grown to where it seems unmanageable. The sheer number of homeless is staggering, the costs massive. If you were to zoom-in, and focus on a part of the problem where a single person can make a difference, suddenly you realize you can make a very real contribution. The Signs of Victory Ministries, at 1100 SE Jackson, has opened an expanded shelter and needs a bunch of twin-size bunk bed mattresses because right now some folks are sleeping on cardboard. If you don’t own a pick-up to haul your new mattress contribution to their physical site, you can just click on the Go Fund Me button at the bottom of the ministry’s web page. With a click of a mouse, you can do something to help in this difficult problem. Think global. Act local. There’s been homeless people in Albany before, during, and after the 60’s! They lived on the river for the most part. Simpsons pond area, by the hospital, almost anywhere off the williamette and calapooia. Most people didn’t go to that area or pretended it didn’t exist, and they kept to themselves. But things change, drugs change, police enforcement change, and it brings it to your door step. Is Albany in need of a tent City? Would CARA fund that? Would our mayor be able to handle that? I believe a tent City would be at least a start for some, somewhere to go every night instead of trying to find shelter, hopefully giving them that step towards working for their own place. Congrats on this idea. Our City Moms and Dads toot the compassion horn with great regularity, but mostly it is just sound and fury signifying little. If CARA can subsidize a cupcake-maker downtown and a kiddie carousel, it may be possible to underwrite a tent city project for the homeless, or just use the empty buildings sitting unused. The homeless certainly must be as valuable as cupcakes? I have met many homeless people in my 20 years as a registered nurse. In all of those years I have never met any person who “chose homelessness” who did not suffer from mental illness and/or addiction. I would like to meet some of these people you mention who are not addicted or mentally ill and still choose homelessness. And what has been your exposure to these folks outside of your professional capacity? I think it was KGW that did an ‘expose’ on it recently and glossed over the comments made by those folks that chose to remain on the streets regardless of assistance being offered. 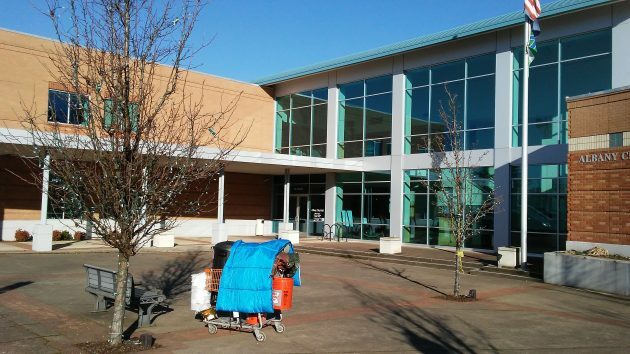 And it was just a couple of years ago when there was talk of building a homeless camp in south Corvallis and there was this one guy interviewed who was very upfront that it was a choice for him. Also, you might want to talk to some of the guys that hang out on the side of the Corvallis Post Office…really nice folks…it’s their choice. Same with the guy who hangs out with his dog on the side of the strip mall that houses Safeway on the way to Philomath. While not technically ‘homeless’…he rents a room…he doesn’t work though he could. There have always been ‘homeless’ people…we once called them ‘vagabonds’, ‘tramps’, even ‘gypsies’…it was a ‘lifestyle’ choice if you will. And if people want to live that lifestyle, who are we to force them into jobs and houses? But with choice, comes responsibility and accountability and therein lies the problem. It is remarkable that Cheryl P would site a broadcast television station’s News report on homeless. The children who occupy the Producer, News Director and Managing Editior positions in most TV stations are inexperienced, and generally only keep their positions if the station’s ratings are sufficiently high. To quote anything a 20-something Reporter has to say about nearly anything is absurd. When I read her comment that “some guy who hangs out with his dog…” wishes to remain homeless, I think the commenter is really out of touch with reality. Well, actually, in my non-professional life I see homeless people more often than I do at work. 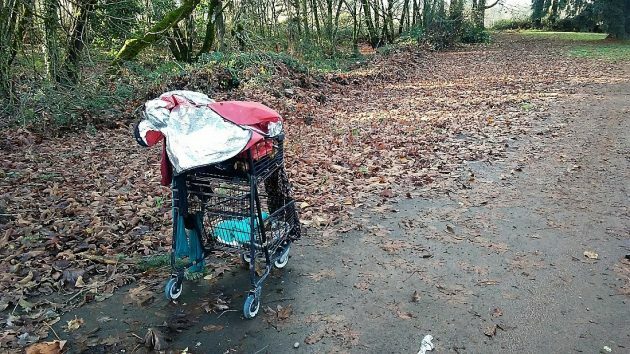 I live about 200 feet from an area on the Willamette River next to the Dave Clark Trail where homeless people occasionally shelter themselves overnight. In the summer there will always be one or two people sleeping overnight on the riverbank. I have not encountered anyone doing this who was not obviously abusing drugs or mentally ill. I make that determination based on my experience as an ICU nurse who frequently provides direct bedside care to people with mental illness, brain injury, and/or addiction. I think that people and families who face temporary homelessness due to lack of affordable housing are not the population who frequent my neighborhood, and I realize that my experience with homeless people does not represent the whole story. Nevertheless, I have not personally met anyone of sound mind (emphasis on ‘of sound mind’) living on the streets (or the river) who is doing so out of choice. Hard for me to see this concern improving. Especially with the Rethuglican tax give away to corps and the RICH. “Little Marco” gave it away when he spilled the next step. You all remember 45 name calling Rubio. Well Rubio said the next step is to go after entitlements. Medicare, Medicaid, Social Security, etc. in the social safety net. I could be wrong but I really doubt seeing things improve with “trickle down on steroids”. I agree with what Rachel La Brasseur said, homeless folks have been in Albany for a long time. I wasn’t around then, but relatives have told me that the homeless have lived by the Willamette for a long time. My Granddad used to interact with them because he worked nearby the river. Mental illness, drug addiction, and high rents, as others have already stated, are terrible problems. They all increase homelessness in our area and across the country. I think the comments of Cheryl P are quite mean spirited. She’s entitled to her opinions, but I’m also entitled to mine, and I feel quite strongly that they are mean spirited thoughts. Ahh, a bus ticket to sweep the vermin away. That just kicks the can down the road. Cheryl P backs the “choice” cause. That’s not much better than an excuse to do nothing. Choice is likely an effect rather a cause. Weak coping skills, bad support, life experiments gone awry, the need to just plain not feel bad, are just a few things along the trail. Having said that, there have been a significant number of highly-revered square pegs— explorers, trappers, mountain men. We need to discuss how to get rid of them. One sign of mental illness is a desire to live outside of shelter, that self destructive mindset is part of a dissociative disorders. But, there is a proven correlation between the amount resources dedicated to homeless efforts and the number of homeless in town, both increase at the same time. A “Tent City”? Anyone suggesting that is off their rocker! It would double the population size of the problem! If you truly think that is the solution create a mini tent city in your back yard, most yards could probably host 4-5 good size tents… take ownership of the problem! But, noone wants to be that involved in inviting risk into their safe space. I’d rather our city took in nuclear waste than a tent city… it would have the same environmental impact.